Undefeated WBC Heavyweight World Champion Deontay “The Bronze Bomber” Wilder will face his toughest opponent to date when he meets hard-hitting Cuban southpaw Luis “The Real King Kong” Ortiz Saturday, March 3 from Barclays Center, the home of BROOKLYN BOXING™ and presented by Premier Boxing Champions. The co-feature of the evening will see the return of undefeated former 154-pound world champion Jermall Charlo, a powerful knockout artist who is looking to prove that he is a dangerous contender in the star-studded middleweight division. Once-beaten contender Hugo Centeno Jr. will test Charlo’s 160-pound credentials when they meet in a 12-round match to determine the WBC interim champion, with the winner immediately stepping into the picture for middleweight supremacy. Tickets for the show, which is promoted by DiBella Entertainment and TGB Promotions, start at $50 and are on sale now. To purchase tickets, visit Ticketmaster.com, BarclaysCenter.com, or call 800-745-3000. Tickets for the event can also be purchased at the American Express Box Office at Barclays Center. True heavyweights in every sense of the word, the 6-foot-7, 228-pound Wilder and the 6-foot-4, 240-pound Ortiz have 62 combined knockout victories. The 32-year-old Wilder (39-0, 38 KOs), the only reigning American heavyweight world champion, is a knockout artist with the power to end any fight in spectacular fashion. His only professional match that went the distance was the fight in which he won his world title with a dominant 12-round unanimous decision over Bermane Stiverne on Jan. 17, 2015 -the birthday of legendary heavyweight champion Muhammad Ali. 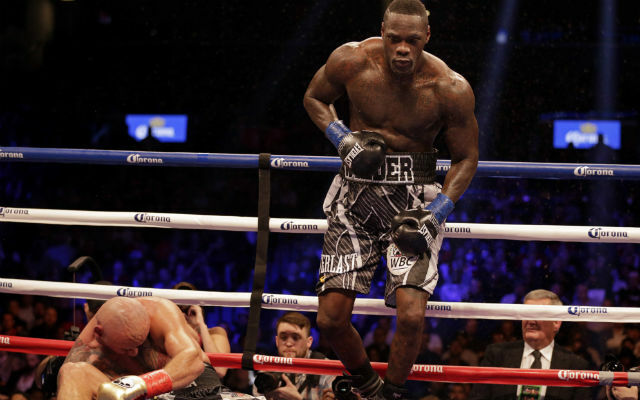 The champion out of Tuscaloosa, Alabama added Stiverne to his list of knockout victims in his last fight with a devastating first round destruction in their rematch at Barclays Center on Nov. 4. Wilder was originally supposed to fight Ortiz that night, but Ortiz was pulled from the match after he tested positive for a banned substance. Ortiz was later cleared after the WBC determined he had failed to list medication that he was taking on his pre-testing paperwork, which triggered the positive test. He was assessed a fine and allowed to resume boxing. Wilder, a Bronze Medal winner for the U.S. Olympic boxing team at the 2008 Beijing Games, has successfully defended the title six times. This will be his third title defense at Barclays Center. In his first defense at Barclays Center, Wilder scored a memorable ninth-round knockout over Artur Szpilka back in Jan. 2016. The 38-year-old Ortiz (28-0, 24 KOs), of Camaguey, Cuba by way of Miami, Fla., will make his Barclays Center debut when he meets Wilder for his first title shot. The hard-hitting southpaw turned pro seven years ago after defecting from Cuba and has since been steadily climbing the heavyweight ladder. He cemented his standing in the division with victories over veteran contenders Bryant Jennings, Tony Thompson and Malik Scott and is the No. 1-ranked contender by the WBC. In his most recent fight, Ortiz scored a devastating second-round knockout of Daniel Martz in Miami, Florida on Dec. 15. If Ortiz wins, he will become the first Cuban born fighter to win a heavyweight world championship. Charlo (26-0, 20 KOs) won his super welterweight title with a dominant knockout of Cornelius Bundrage in 2015 and eventually achieved the distinction of holding a world title in the same weight class (154 pounds) as his twin brother after Jermell won a title in 2016. After successfully defending his 154-pound title three times, Charlo of Richmond, Texas decided to move up to 160 pounds to win another title in a different weight class. In his debut at 160-pounds the 27-year-old scored a TKO victory over Jorge Sebastian Heiland at Barclays Center on July 29. The 26-year-old Centeno (26-1, 14 KOs) caught everyone’s attention when he scored a stunning knockout of Immanuwel Aleem in his last fight on Aug. 25. It was enough to springboard Centeno into middleweight title contention. Centeno of Oxnard, California successfully rebounded from a tough TKO loss to Maiej Sulecki on June 18, 2016 with a victory over Ronald Montes before his match against Aleem.